"It's kind of like there's an electric guitar in space and I'm plugging in the cable"
Robyn Rennie hasn’t seen the night sky for almost 13 years. She has centrocecal vision loss, a condition that stemmed from an illness, leaving her with only peripheral vision and a loonie-sized area of vision at the centre. “When I'm looking at the normal night sky, I'll see something at the corner of my eye twinkling but when I turn to look at it directly, I can't see it anymore,” she says. She says she misses being able to spot Orion from the window of her Orillia home. She used to find it constant and comforting. Wanting to help her mother relive that experience, Rennie’s daughter Erin decided to contact University of Toronto’s planetarium to see if there was something they could do. Erin was put in contact with Matt Russo, a planetarium operator at U of T, formerly a postdoctoral researcher at the Canadian Institute for Theoretical Astrophysics (CITA) in U of T's Faculty of Arts & Science. Russo is both an astrophysicist and a musician. He decided to combine his passions to create music out of the movement of objects in space alongside Dan Tamayo, a postdoctoral researcher at CITA and the Centre for Planetary Sciences at U of T Scarborough, and friend and band mate Andrew Santaguida. Their musical project is called SYSTEM Sounds. When Erin got in touch, Russo just happened to be designing a planetarium show geared towards the blind and partially sighted. He invited Rennie and her family to come to U of T for a preview. “My son came from Belleville and my brother came from Wasaga Beach. Everybody came down to Toronto for the day,” says Rennie. Russo is now bringing the unique experience to the public with Our Musical Universe, an audio-focused planetarium show debuting this Friday at the University of Toronto Planetarium on the downtown Toronto campus, presented by the Dunlap Institute for Astronomy & Astrophysics. 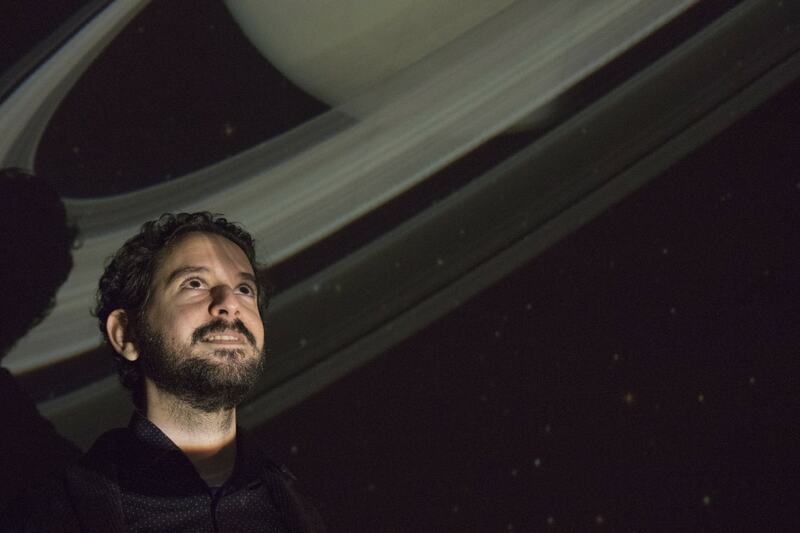 Attendees will hear the sound of a night sky full of stars, fly through the solar system and hear the rings of Saturn and the moons of Jupiter, listen to deep space through the sounds of the Voyager probe and hear the afterglow of the Big Bang, says Russo. To make this genre of cosmic music, Russo and his colleagues use the rhythm of planets orbiting and the pitch from speeding up the sound of planets oscillating by around 200 million times, he says. When Russo began releasing “space music,” as he calls it, he was contacted by people who were blind or partially sighted who said they were thankful for having a way to experience and engage with astronomy. This was the driving force behind creating the planetarium show, he says. In addition to the audio and visual presentation, Russo’s planetarium show will offer a tactile experience. People will be able to feel Saturn’s rings on a three-foot-long wood carving, touch the spiral arms of a galaxy or the cloud bands of jupiter, and hold 3D-printed constellations. “They can feel the bumps and lines to feel the shapes of the constellations in the night sky,” says Russo. Inspired by her trip to the planetarium, Rennie, who is an artist, created a painting called “Myth,” using textures and rich colours to tell the story of how she sees the universe. “Stories are the same. Stories are always open to interpretation,” she says.